Have decided it’s time to add a water softener to your home? There are many benefits to having a water softener from using less soaps and detergents to getting rid of hard water residues. You’ll notice it take less shampoo to get your hair feeling clean and soft. Also with soft water your skin won’t feel as dried out, those with easily irritated skin will also find soft water to help their skin. Now that you’ve made the decision to add a water softener here are 3 things you need to consider? Where will the water softener be installed? What fixtures do you want to be exempt? What size of Water softener is needed? Often the water softener is installed in your utility or mechanical rooms but that doesn’t have to be the case. 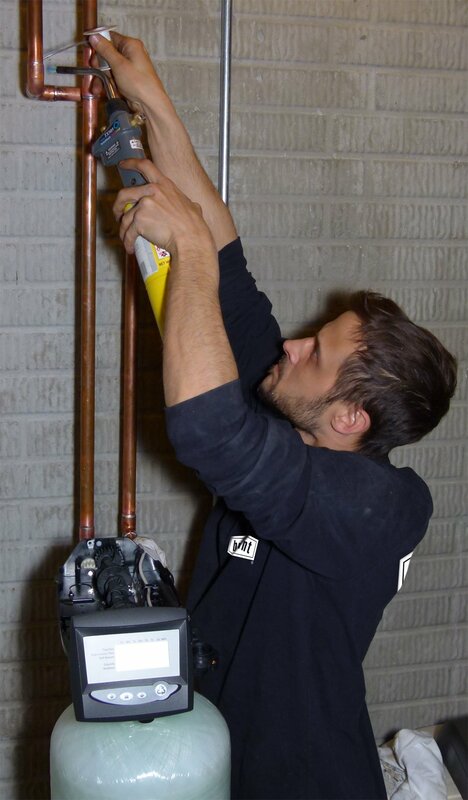 For one do you have room in the space where your furnace and water heater are located? Those utilities need to have enough room allowance to allow for maintenance, repairs and replacement when the time comes. Yes it’s ideal to have your water softener in the same area, especially if there is a floor drain in that room. It is possible to install the water softener in a place where a floor drain is not, but a drain line will need to be able to run to a floor drain. If you are installing a 2 piece water softener system like the products that Bryant carries you’ll need at least an area around a 30 square inches for the unit to sit. Depending on the set up your home though it may be possible to have the salt tank located somewhere else to make restocking with salt more convenient, such as on the first floor when the resin tank resides in the basement utility room. These are things to discuss with your plumber before installation day. What Fixtures Do You Want Exempt? There are likely some places where you don’t want soft water in your home. To ensure those fixtures are exempt from the water softening process your plumbing in a new home will have to be set up accordingly and an older homes plumbing may need some alterations. Often outdoor spigots and the kitchen sink and ice maker cold water lines are places you won’t want soft water. Have your plumber take a look at how this can be accomplished. If your plumbing lines are exposed and not above finished ceilings this makes things much easier. Determining the correct size of water softener for your home is fairly simple. Typically this can be determined by factoring how many people live in a home and how many gallons of water they use throughout a day. Homes that have a greater number of showers and do more laundry will likely need a larger water softener. The total number of gallons of water used in a day is multiplied by the grains of hardness in your water. This will give you a general idea of the size your water softener should be, however it is possible to slightly increase the water softener to reduce how often the softener will have to regenerate. If you are interested in adding a water softener to your home contact Bryant Air Conditioning, Heating, Electrical & Plumbing and ask for a free estimate. Give our plumbers a call at 402-470-8162.